Please be informed that the role is temporary for 12 months. After the introduction into our ERP system and our policies you will work together with international Orbium financial controlling department in development of internal reporting processes and tools. 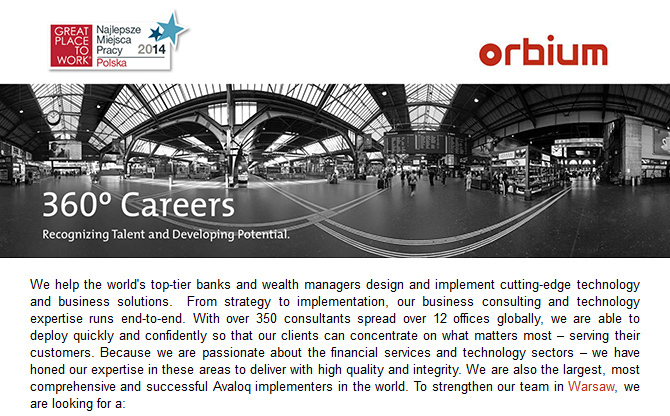 Your role will be also to support Orbium employees in daily ERP system use. Provide internal support to our employees with various requests regarding ERP system. Development of advanced reports templates on MS Excel with macros and VBA or Qlikview. Daily, ad hoc reporting for various internal needs. Analysis and development of interfaces between the ERP system, Oracle DB and Excel. Preparation and maintenance of the functional documentation related to the ERP system. Participation in planned implementation of new ERP system. At least bachelor degree from finance, economics or equivalent. 3-5 years of experience on a similar position. Proficiency in MS Excel, very good skill related to macros and VBA. Creative approach to completing tasks requiring considerable judgement and initiative. Orientation to details and quality. Ability to work independently, organized and results driven. Excellent communication skills with a good command of written and spoken English is a must. Diverse and challenging assignments, possibilities to develop multi-disciplinary IT / business skills, training path, a competitive compensation package and the unique opportunity of being part of a fast growing and dynamic consulting and IT implementation firm. If you are interested in a new challenge within a young and very motivated team, please send your complete application to: [email protected].